I had to throw the towel in and email my doctor because after 2 weeks the cough and cold symptoms were not going away. So I’m on 5 days of antibiotic to tame possible infections which can cause other challenges killing good bacteria too. So I’m throwing in more pro and prebiotics this week with big salads and sauerkraut. Ah, I love mixing this stuff into salads, that tangy dill flavor is addicting. 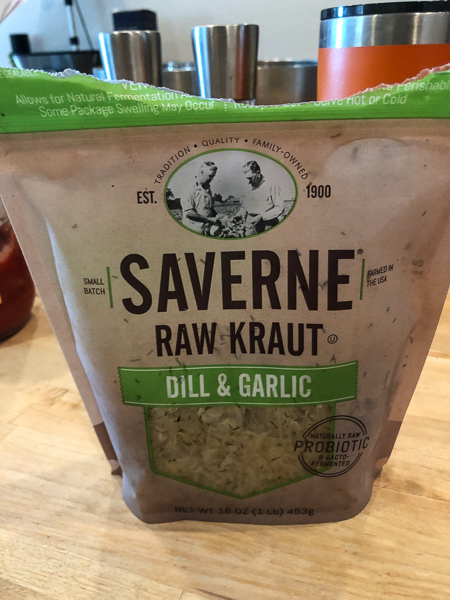 And this Saverne Dill & Garlic Raw Kraut hits the spot. But what about the liquid sauerkraut comes in? Seems like a shame to waste all that flavor. 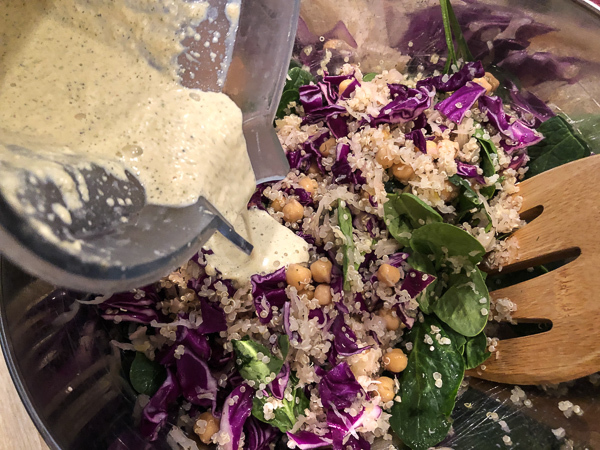 It’s fun to whisk with hummus for a fast dressing. But it’s amazing in this simple tangy dressing that rocks raw garlic too. Place all ingredients into a high speed blender and blend to a smooth and creamy texture. Serve and enjoy. Makes 2-4 servings. It’s creamy and satisfyingly tangy with a Dijon kick and just the right amount of garlic without being overpowering. 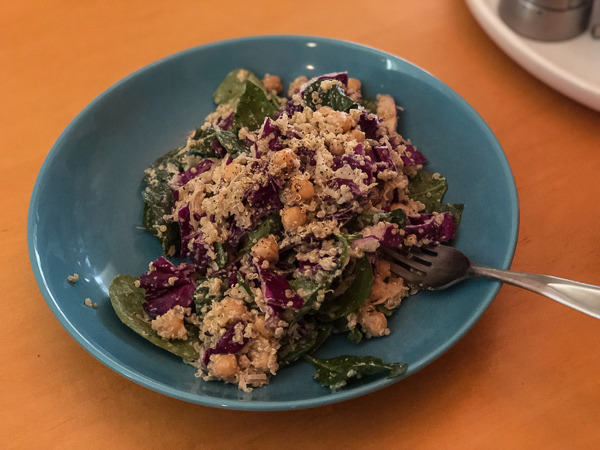 And coated and interesting salad of spinach, quinoa, chickpeas, and cabbage for a hearty meal salad. This dressing would work great for a simple grain salad too or as a dip. And I had a competitive audience since we still have my mom’s dog and he wants everything Miko wants. 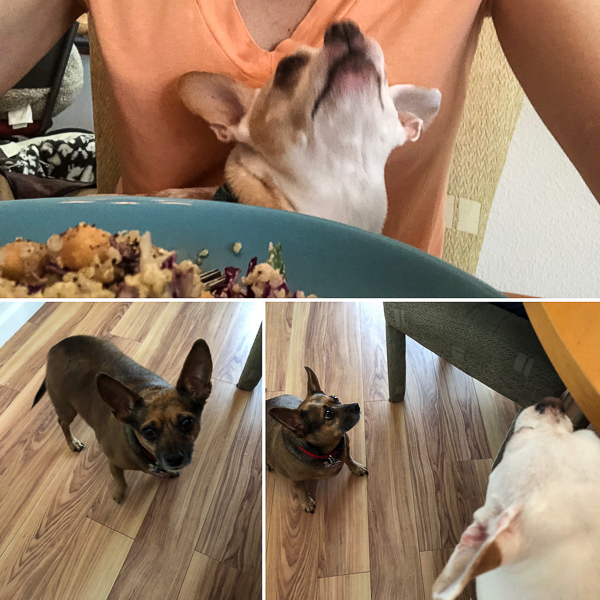 He decided he likes cabbage too, so he is learning to eat healthier with us which he needs! 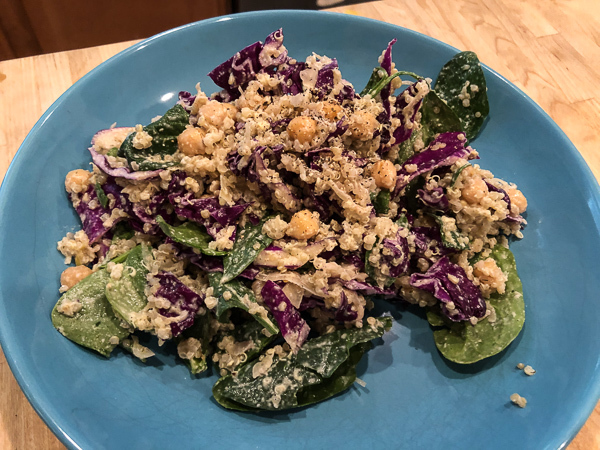 I’m sorry to hear about the inspiration for this dressing, but delighted to benefit from the results! I do love sauerkraut but never blended it into a dressing before. Thanks, getting better. :-) Yes, this is such a fun way to use the brine.